Anna's House Foundation is a community of several homes in Luther, Oklahoma that are dedicated to providing foster children, ages birth to six years old, with a stable and nurturing home environment until a more permanent/long term foster or kinship placement can be found. This unique community serves as an alternative to the continuously over crowded shelter system and the high probability of multiple moves. 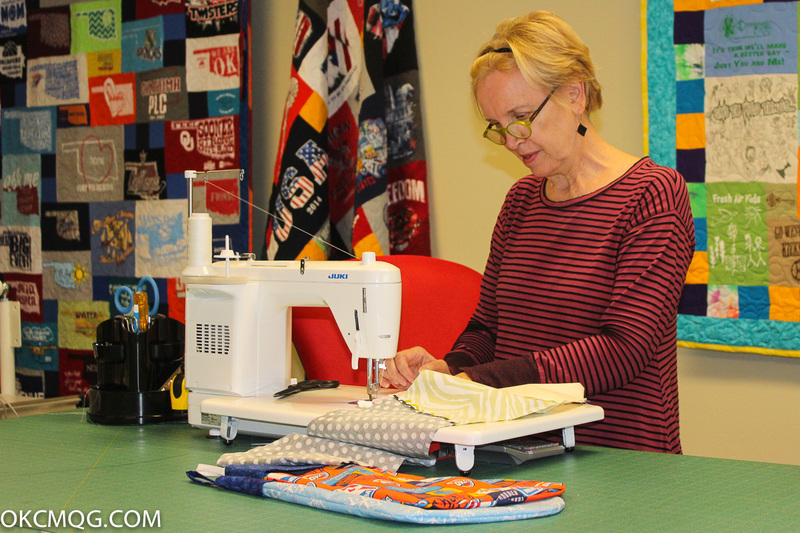 The OKCMQG is committed to providing a quilt to each child upon their arrival to the community. As most kids arrive with very little, these quilts will belong to each child and provide warmth and comfort to them wherever they may go. 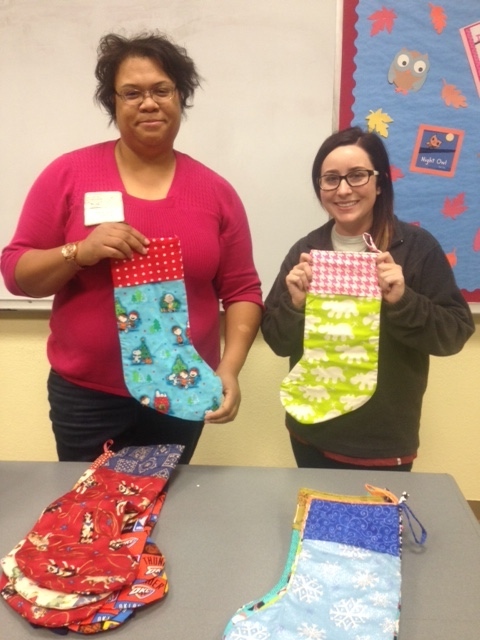 OKCMQG President Shirlene Davis presents the stockings to Shelby Henrici from Anna's House. Thank you OKCMQG members! 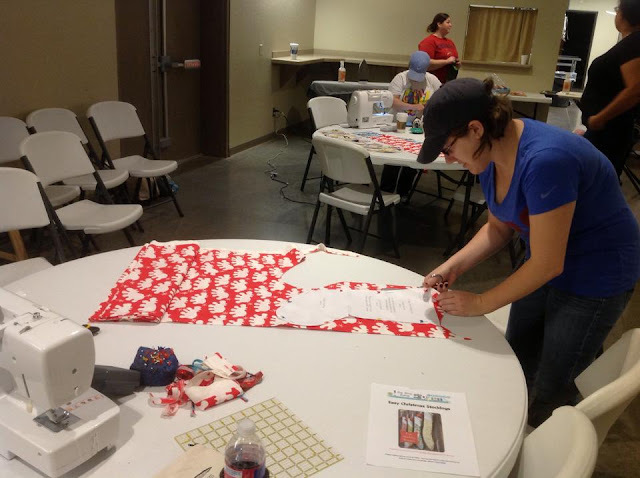 We achieved our goal of making 135+ Christmas stockings for Anna's House! Undertaking a task such as this is quite a process. Here's how it all went down. When Anna's House requested Christmas Stockings for approximately 135 children in foster care we quickly said Yes! 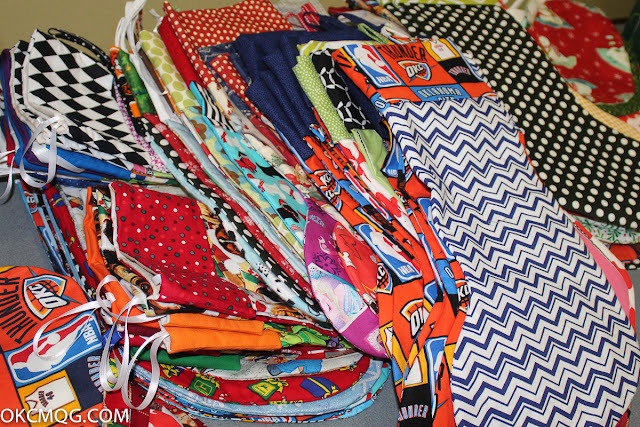 and set a date for a stocking Sew Day. With each of us taking a different part in the process we came armed with ironing boards, cutting mats and sewing machines. 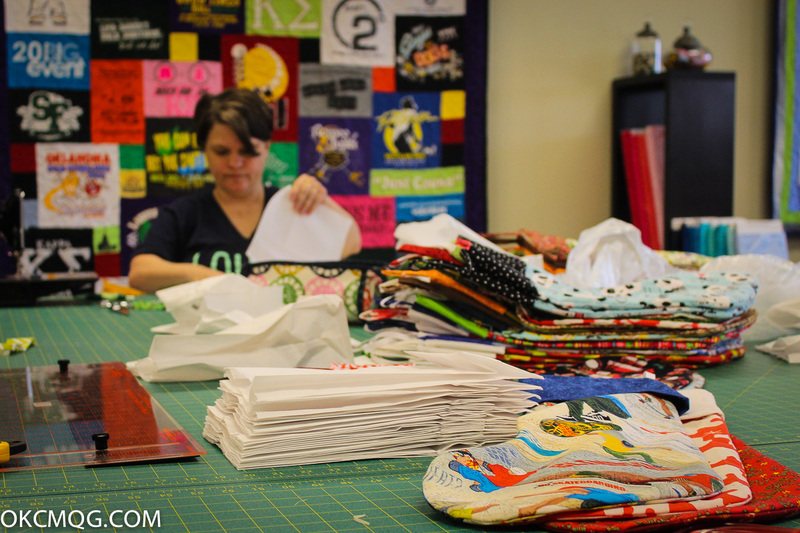 Much of our fabric was donated by members (Thank you all!) with the Guild providing additional supplies as need. 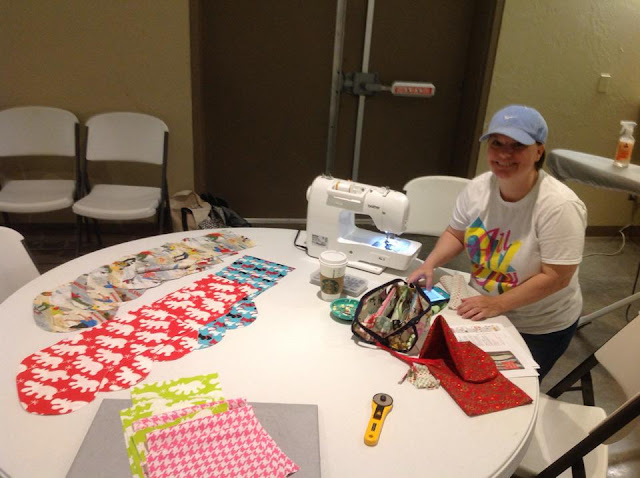 Every quilter and sewist knows you can't begin cutting until your fabric is pressed, so two ironing stations were immediately set up. We even had a visitor who saw our Sew Day advertised on this blog and came and pressed for several hours! 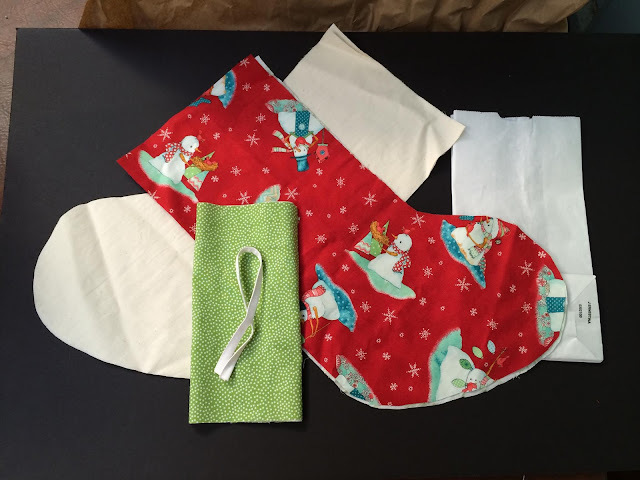 We used a FREE STOCKING PATTERN found on the site So Sew Easy and fabrics and linings (oh yes, they were lined) were cut. 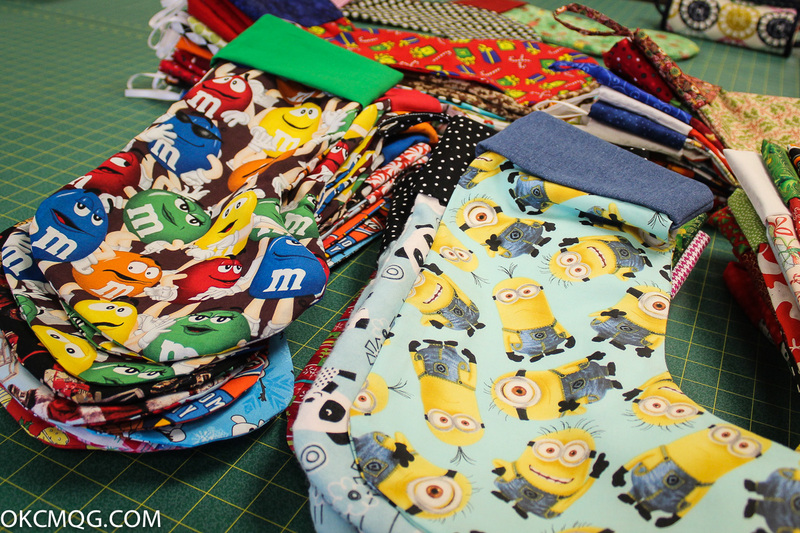 We had a terrific assortment of fabrics, most of which were not Christmas-themed...because, honestly, what kid wouldn't want a stocking with M&Ms or Minions on it?! Stockings and cuffs were coordinated and cut, while linings were cut from muslin. 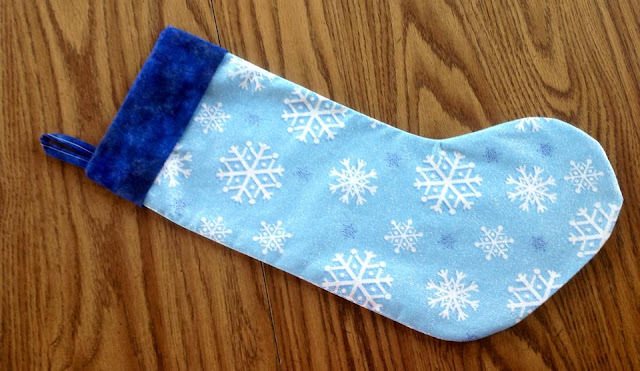 And don't forget the stocking hangers! Just prepping the pieces for assembly was a big undertaking. At the end of the day, only a dozen or so stocking were actually completed. The remaining stocking pieces were then grouped and placed in bags as kits for members to pick up and complete at home. 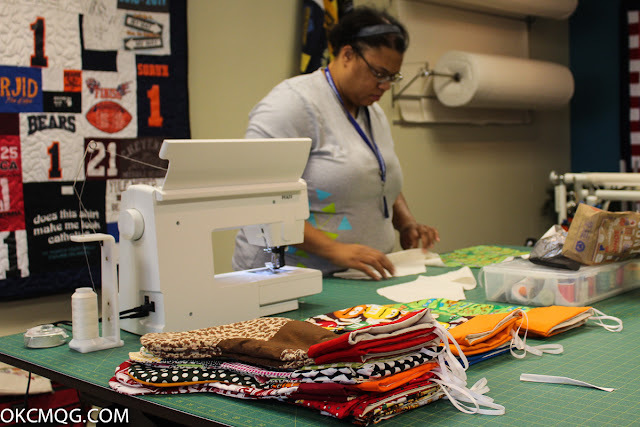 With most of the stockings assigned for home construction, a second Sew Day was scheduled to cut and complete the remaining stockings. 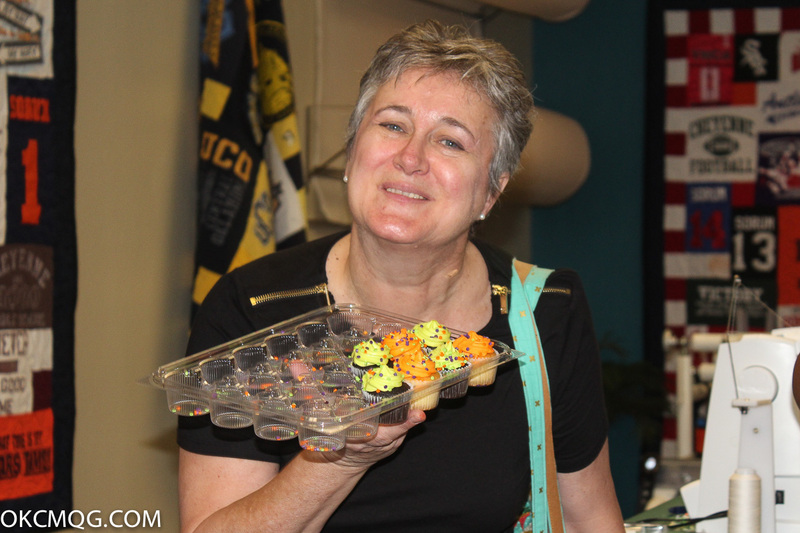 We achieved our goal and Agnes had cupcakes on hand to celebrate! We couldn't have done it without everyone working together! Follow directions on So Sew Easy to download stocking pattern. Cut stocking and lining as directed, but cut cuff 15.5" x 9". 1. Cut stocking cuff in half. You will then have two pieces cut 7.75" x 9". 2. Line up two sets of stockings: outside - cuff - lining (Make sure toes point the same way!) Sew with right sides together inserting the stocking hangar between the cuff and lining on the side of the heel as shown above. 3. Place the two long pieces right sides together on top of each other. Mark about 6 inches on the calf area of the lining. Do not sew this area. 4. Sew around the perimeter of piece, leaving open the 6 inches you marked. Trim seam allowance with pinking shears or snip curves to ease turning. 5. Carefully pull stocking through the opening and turn right side out. 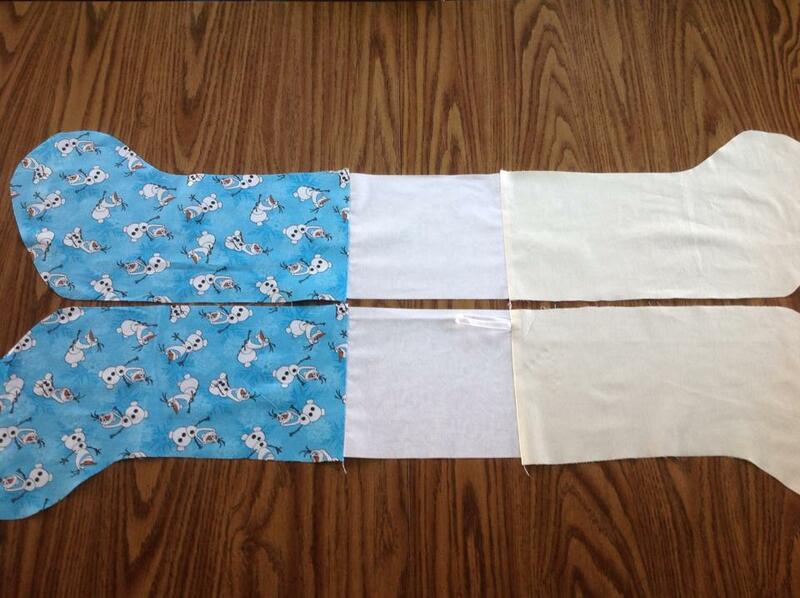 As if top-stitching, sew the opening closed. Tuck lining into body of stocking, easing it with your hand. 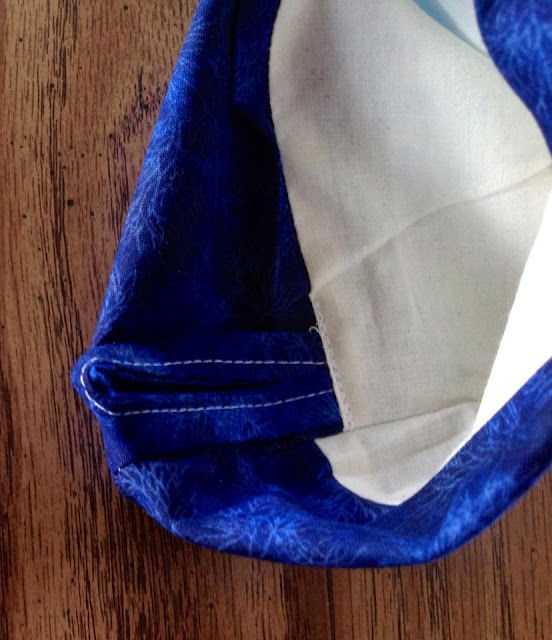 Fold over cuff. 6. Sew a few stitches to reinforce hangar.